There are parts of Alberta that were settled by the French and it is common to hear French being spoken. 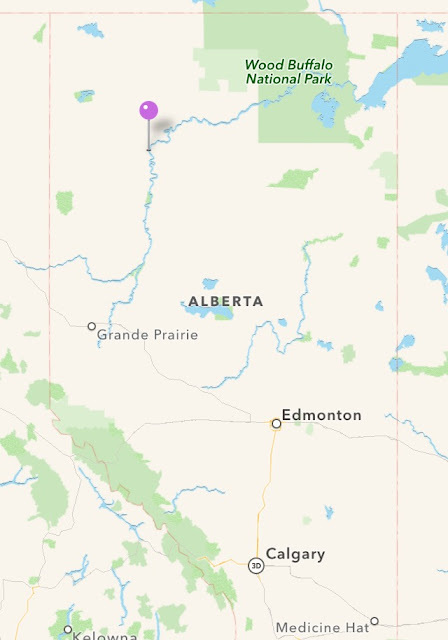 I was in Falher, Alberta which is not that far away from Guy. I stopped for gas on my road trip and when I went inside to pay the customer in front of me and the cashier were conversing in French. I am unilingual, I am not one of those that can pick up a second language. Years of French classes in school made practically no impression on me. In parts of Alberta it is common to seen Catholic churches, schools, and what were once hospitals. Their churches always seem to stand out. Two-lane traffic still crosses this bridge albeit one way, north to south. The first time you drive across the bridge is a little interesting, two split southbound lanes converge right at the entranceway to the bridge and the turns from both lanes where they meet up are slightly sharp. I lived in the Edmonton area for about twenty years. Edmonton is a pain to get from the downtown north part of the river to the south, and vice versa. To be fair, I am sure city planners many years ago never thought there would be this many people and this much traffic to contend with. It seems they are constantly trying to fix traffic issues and never quite succeeding. In all my time there I rode the LRT once and never took the street car. When I was there on August 17, 2015 I was done with an appointment and thought I would zip through the downtown over the bridge and hit the Queen Elizabeth II Highway south to home. That was a mistake. There is a Canadian cliché which definitely holds true for Edmonton, there are two seasons, winter and construction. Being on a motorcycle held no advantage, no matter where I turned I ran into road construction. By the way, if you ever want to experience cold Canadian weather, try Edmonton in the winter. Saw this August 22, 2015. 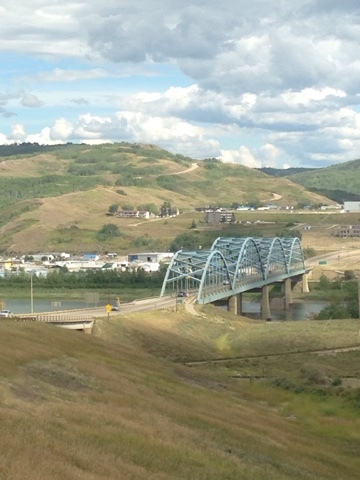 The town of Peace River with the Peace River Bridge crossing the Peace River. Nothing really to say about this. I just like the view. Founded in 1915 and originally started off as Bingham which was about one kilometre from this site. When the railroad passed Bingham a new town started up here and most of the residents moved. 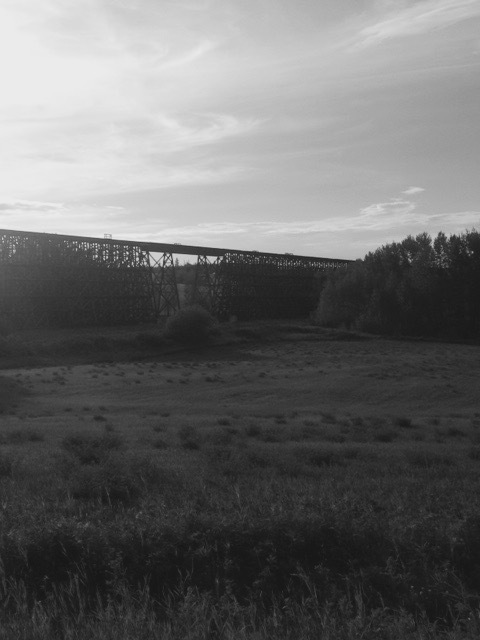 At one time there was a community hall, four grain elevators, a school, and a service station. Now there are abandoned buildings and one or two occupied houses. The cemetary is right on Highway 61, The town is a couple of kilometres away. That sign has been there for years. I have seen it in older photos on ghost town forums. It was still there when I showed up. Old store and garage building. On the other side of the road is a communications tower. Someone on a prior post left a comment about revisiting places. I found the comment interesting as I frequently note that some places that I have been to I will make a return trip in the future. I am not nostalgic by any means. I have lived too many places that have underwent too many changes. I have moved over forty times in my life and I consider myself to have no hometown. I do have a few destinations that have become favourite places over time and if I am driving by I will always try to make a stop. I like to revisit places simply because I miss stuff the first time around. When I was recently in Morrissey checking out the coke ovens a few days later I read there were further ruins up the road that I previously did not know about. I am not sure if they still exist but to me this warrants a further trip sometime in the future. If someone likes to tag along on a road trip I like to introduce them to something they might enjoy. I like to take in as much as possible and to get ideas for further trips. I am a big fan of Google Maps and Google Earth. I look for places that pique my interest. I also look for photos tagged to locations. There seems to be a few glitches from whenever they last updated as some points of interest and businesses are marked as being located in the middle lakes. I checked out Endiang, Alberta a few times on Google before driving there. I honestly expected a town on the verge of becoming a ghost town. Definitely not the case. It is a very small place. You can tell that it used to be bigger years ago. It is neat and well kept. There are markers pointing out the history of the place where various things once stood. This place is on my "revisit" list simply because I was driving through here to get to somewhere else. I found something different than what I expected and would like to go back and see what I am missing. 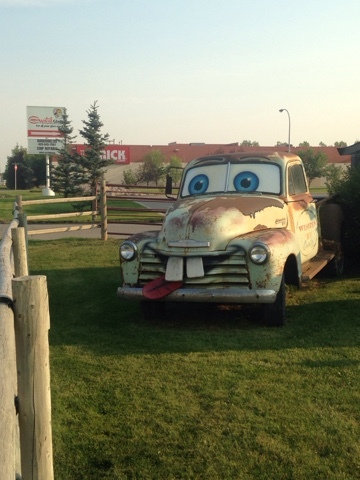 Outside Western RV August 13, 2015. 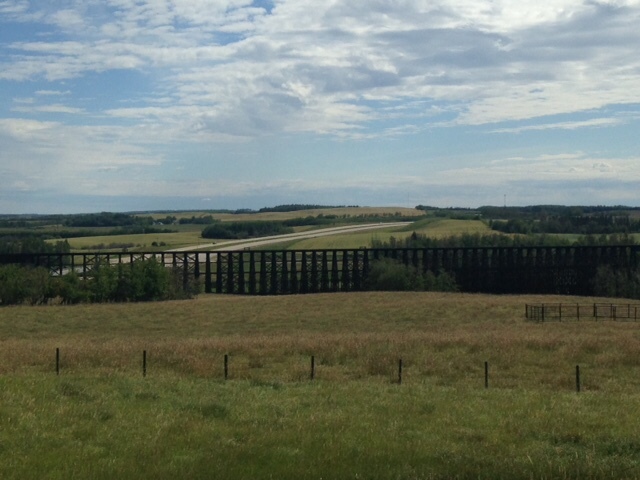 August 2, 2015 just north of Carvel, Alberta on Highway 770. 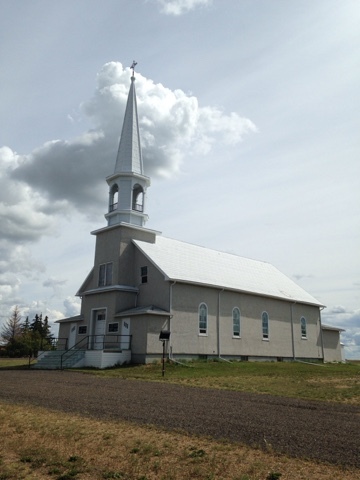 Churches of this type are a common sight in parts of Alberta. I could not get inside. Cemetary is in the back. Saturday August 22, 2015 I was getting myself somewhat mobile to accomplish something when I received a phone from a long-term friend. He told me he was in Innisfail, which is about forty minutes away from where I live, and he asked what I was doing. I told him I kind of had an very loosely planned day trip planned to visit some old schools, churches, and possible ghost towns in the Hanna area. I mentioned that if he wanted to join me he was certainly welcome. He said he had drove to Innisfail in his four wheel drive truck. This was fortuitous as I was thinking earlier in the day a truck would be great since the recent rain had probably made the backroads muddy. He repeated he had a truck. So I said that I guess that means you are coming. The day was spent exploring Alberta and catching up. We had fun as we have a lot of the same interests. The backroads were muddy and the truck did come in handy. Helpful tip, you cannot always trust your map, sometimes roads turn out to be little more than trails. 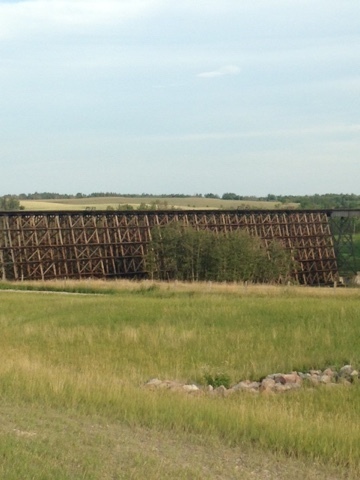 Rochfort Trestle was built in 1919 using twelve inch square timbers to a length of 2,414 feet and 110 feet high. The town nearby is called Rochfort Bridge. The photo below is courtesy of Google. My photo attempts were less successful. I found it difficult to get a decent shot. About the best I can do. Another place to revisit and try again at a later date. Sometimes you see people get creative with pumpjacks. 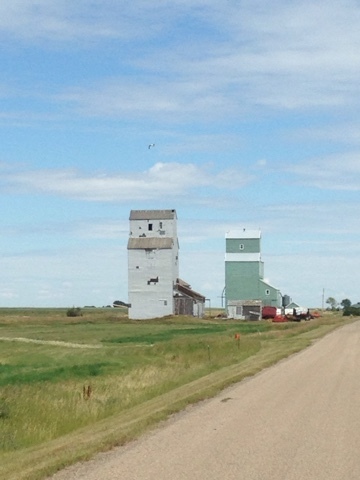 One grain elevator is no longer in use. This is a small town with practically no services. People live here in modern houses. I just wanted to take a few photos of what was left behind by others. This was the only interesting stuff I could find that I liked. Oldsmobile Super 88. As an aside, I am not big on possessions and cars have never really interested me. A vehicle to me is most times a way to get from one place to another. I do appreciate the time and effort that others put into theirs and some of them do catch your attention. 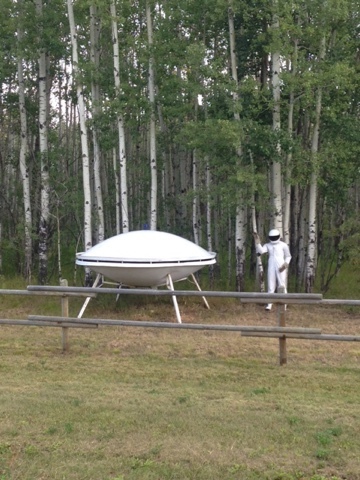 If you drive enough roads enough times you will see some odd things. This was on Highway 740 north of Tangent, Alberta on a farmer's property. So . . . what's next? I accomplished one of my goals by getting to the last ferry on my list in Alberta, the La Crete Ferry on August 2, 2015. 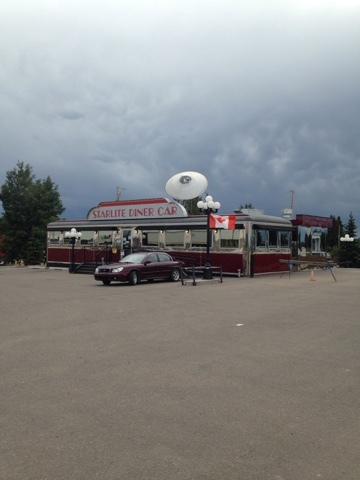 It is the northernmost public ferry in Alberta. I crossed the Shaftesbury Ferry on August 1, 2015. Incidentally both cross the same river. High Level where I spent Saturday night is just a little north. 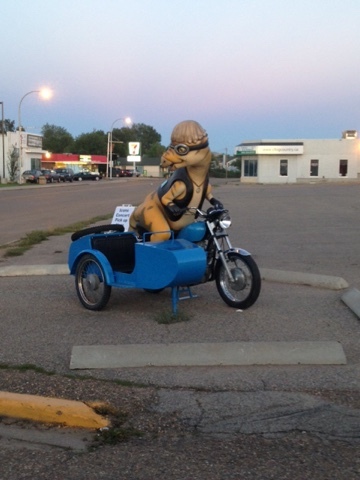 If I felt like it, another hour and a half by motorcycle would have found me in the Northwest Territories. I have been to Yellowknife by plane, I really did not feel the need to drive further north at this time. The descent to the ferry landing. You can make out the ferry that looks like it is just beside the guardrail. The Peace River is in the background. Built in 1987, it is a self propelled ferry and can carry fourteen mid-sized vehicles. One guy was operating it, another was working the deck. On the other side is La Crete, Alberta. I just crossed back and forth as I had a timetable I was trying to keep. I got one of the crew to take my photo with my motorcycle mid-crossing just to prove I was there. I do not post photos of myself as I am never really happy with the results. Needless to say that one is not getting posted. 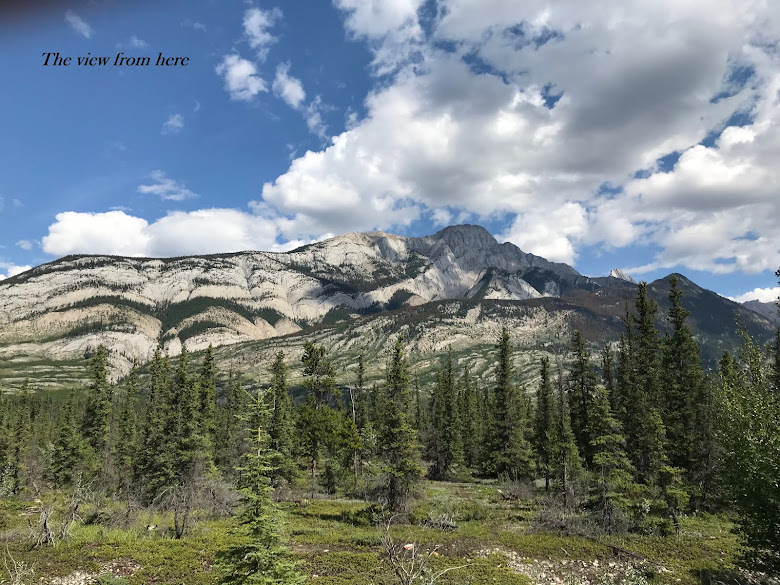 What is peculiar is that on the top of the valley is lots of muskeg. You reach the top to see nothing but muskeg for miles. The river is fairly wide, the crossing is quick as it is a powerful and fast ferry. So, what now? 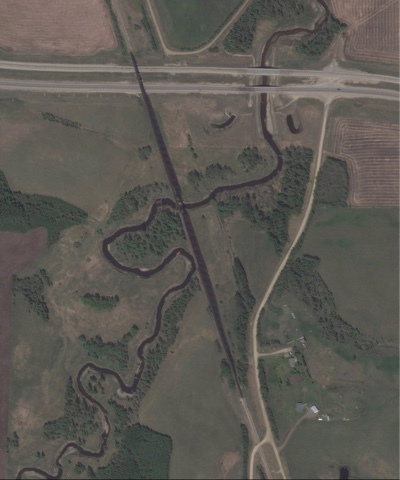 I made a list of ferry locations in Alberta which became a quest to get to all of them. It was also a bit of a private joke. I never really expected to accomplish it due to distance, time, or trying to get someone to join me. I ended up doing most of it myself. I did learn a few things about myself on these trips as much as I reinforced what I already knew. I am comfortable with doing things by myself. If you cannot get someone to go along on something that you want to do then just find a way to do it anyway. I sharpened my improvisation skills and I got a bit more patient about life if things did not exactly work out. What is next is that I find some new goals. It is still not the destination, it is what you find along the way. Founded in 1915. Had a post office in 1916. Only a couple of homes are inhabited now with some old abandoned buildings making up the townsite. School marker. There is a small modern school a block away which in all likelihood is Bindloss #2. The school looks like it has been closed down. I like the look of this by inself in this photo. In reality it is right beside a United Church. I am not sure if the church is still being used. On the road on August 2, 2015. No information on the demonination of the church. Cemetary looks to still be in use, I am not so sure about the church. The doors are intentionally jammed shut. This part of the province has a lot of French heritage so I guess it could be Catholic. The grounds are kept up, the building has long seen better days. I stopped here August 17, 2015. Sometimes you pass something dozens of times and you never think about stopping and seeing what it is about. 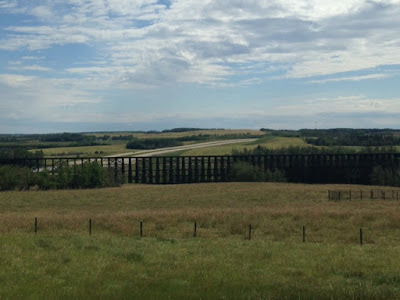 This is just off the main highway between Calgary and Edmonton in Bowden, Alberta. I was coming back from Edmonton and needed a break. This is one of those places that really needs more attention. 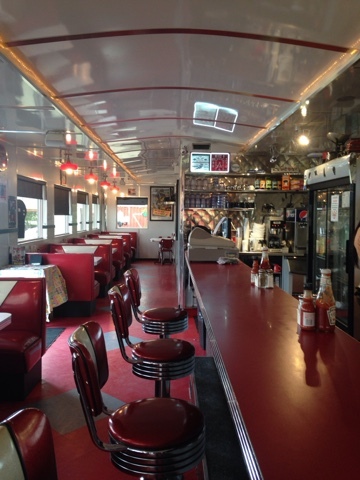 You walk in and it is like being in a diner and for some reason it has an alien theme. The alien theme runs through the decor to even the menu items. I have no idea what connection Bowden has to extraterrestrials. It does not matter anyway, the food was good and that is what counts. 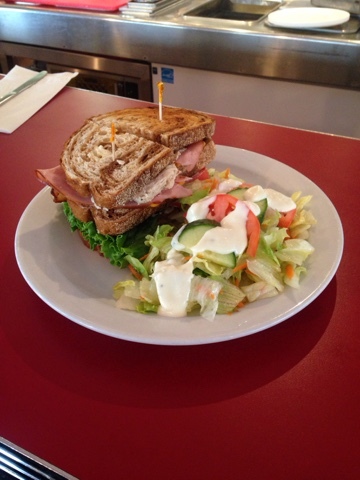 If you are ever in the neighbourhood, stop in. I really like this place. I will be back. 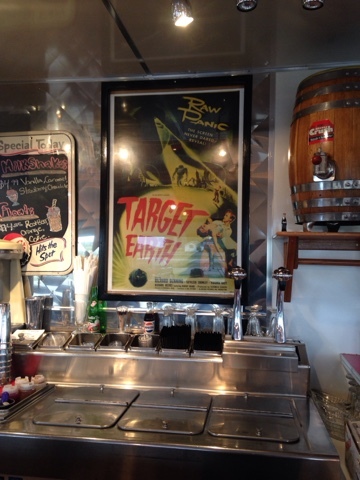 The walls are decorated with old science fiction movie posters. Just quirky enough. My food tastes are not extravagant. Nothing special, it looked good and tasted good. 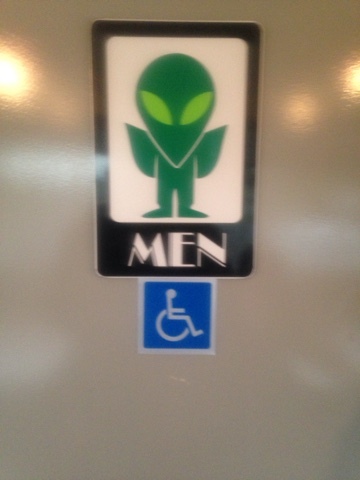 I found this room to be abduction free.